The Irish President and first lady unveil a plaque to Hanna Sheehy Skeffington, Irish suffragette, on June 13, 2018 at Dublin Castle. 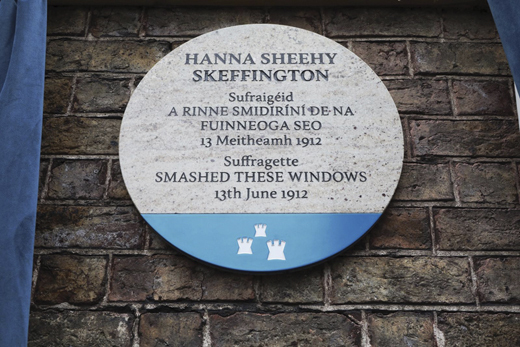 Six and a half years after Hannah Sheehy Skeffington smashed the windows, the first woman was elected to the British Parliament. She was Countess Markievicz, who won her seat as a Sinn Féin candidate in a Dublin constituency. The Countess had been condemned to death for her part in the Easter Rebellion, bet her gender saved her from the firing squad.